Shots were fired near US Vice-President Joe Biden's house in the state of Delaware, but he was away at the time, a Secret Service official has said. The shots were fired on Saturday from a public road in Greenville, outside a security perimeter, Robert Hoback said. The road is several hundred metres from the house, and officials were searching to see if the shots had hit anything. The incident, which happened at about 20:25 on Saturday (01:25 GMT Sunday), is under investigation. The Secret Service said the vehicle from which the shots were fired "drove by the vice president's residence at a high rate of speed". "The shots were heard by Secret Service personnel posted at the residence, and a vehicle was observed by an agent leaving the scene at a high rate of speed," it said. 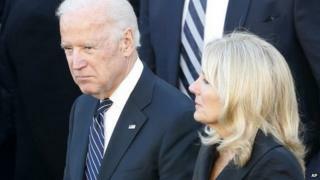 Mr Biden's office says the vice-president and his wife, Jill, were later briefed on the incident. The head of the Secret Service stepped down over that breach and previous lapses in security surrounding the president.